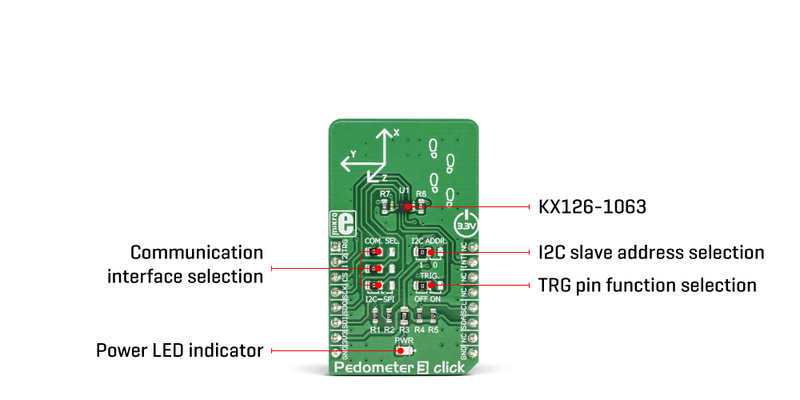 Pedometer 3 click is an acceleration sensing and step counting Click board™ equipped with the KX126-1063, an advanced tri-axis acceleration sensor IC, which features several acceleration detection algorithms, including a pedometer. The micro-electromechanical sensor (MEMS) element itself is based on the principle of measuring the differential capacitance, which further decreases errors due to manufacturing imperfections and temperature. The MEMS element is coupled with a very sophisticated application-specific IC (ASIC), which offers many advanced features, such as the 2048-byte FIFO buffer, pedometer algorithms, tap, and double tap sensing algorithms, free fall algorithms, tilt single/double pole IIR filtering, and more. 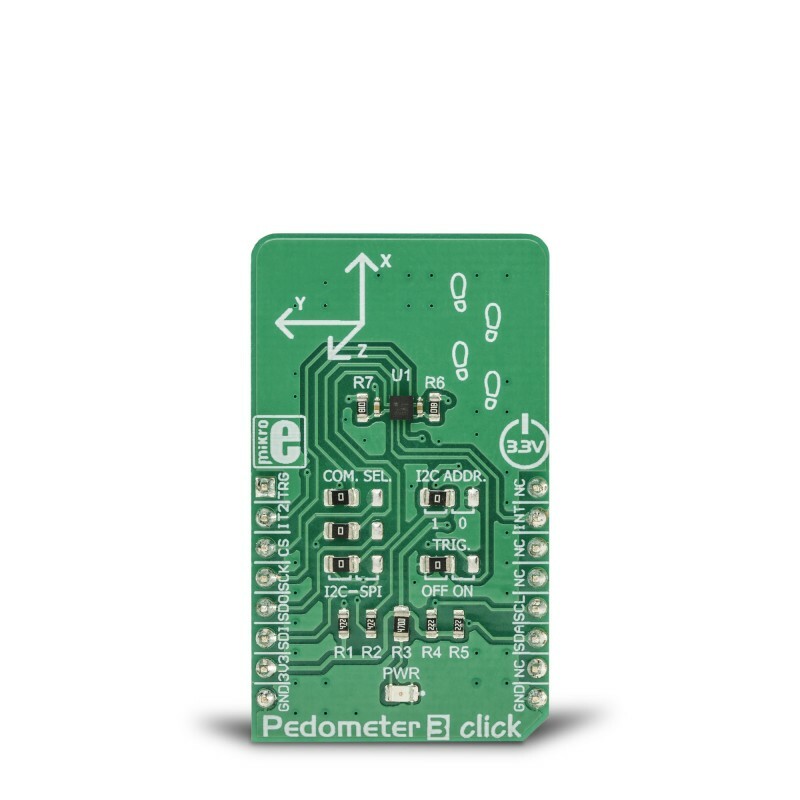 Featuring the KX126-1063 IC, based on the advanced ASIC and reliable MEMS, produced using proprietary Kionix manufacturing technology, this Click board™ is a perfect choice for development of fitness-related applications, which rely on functionalities that Pedometer 3 click has to offer: an advanced hardware pedometer functionality with programmable sensing thresholds for the step detection, the Directional Tap/Double-Tap™ detection, the advanced orientation detection, the freefall detection, the tilt detection with the 8-bit timer, and the motion monitoring functionality, including wake-up on motion with programmable thresholds. Pedometer 3 click is equipped with the KX126-1063, ±2g / ±4g / ±8g / ±16g tri-axis digital accelerometer, by Kionix. This sensor utilizes an advanced acceleration sensing method, based on the differential capacitance. The integrated MEMS, produced with the proprietary Kionix technology, is composed of two plates. One is fixed to the substrate, while the other can move freely along a single axis. The acceleration causes the change in the capacitance between these plates, which is then processed by an integrated ASIC. The ASIC incorporates a capacitance-to-voltage amplifier which converts the differential capacitance of the MEMS sensor into an analog voltage, used as the input for the low-noise A/D converter (ADC). The integrated ASIC also contains the logic section used to set all the operational parameters of the KX126-1063, such as the data rate, filter settings, interrupts, ADC resolution, and other settings. The ASIC also incorporates an OTP memory that contains the calibration parameters and other device-specific settings used on each power-on reset (POR) cycle. The ADC can be operated with the resolution of 8 or 16 bits. This allows power consumption to be managed, as the lower resolution typically allows less power consumption. The power consumption is also affected by the output data rate value (ODR). The ODR value can be set for each mode and is set by different bits located in the respective configuration registers. 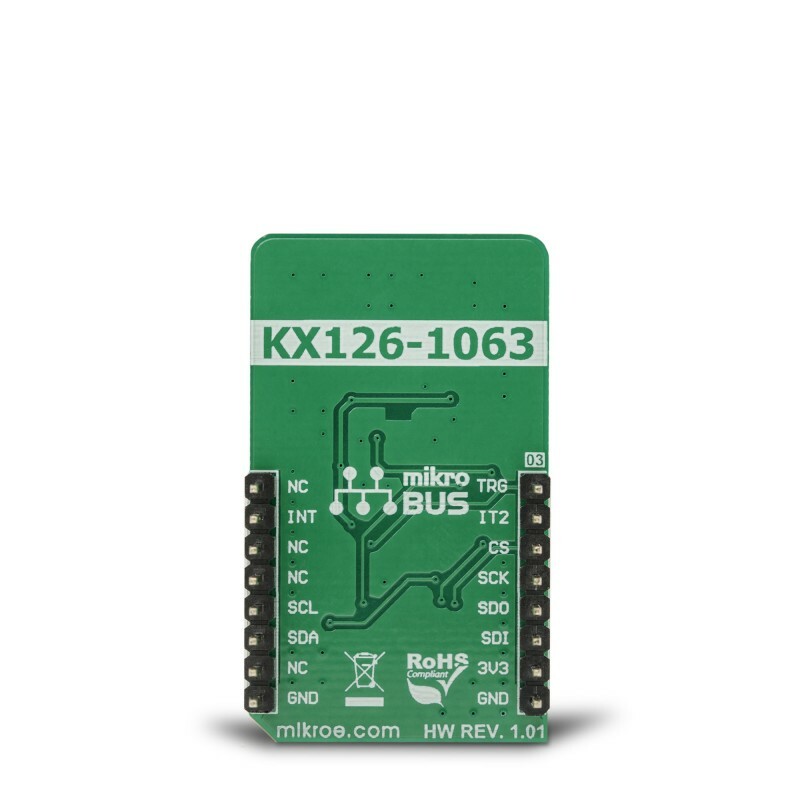 As previously mentioned, the KX126-1063 IC features a range of different detection algorithms, which are used to detect a range of movement and acceleration events. The pedometer functionality is one of these features. In the datasheet, a term engine is used. The pedometer engine can be disabled or enabled, it can have the signal filtering conditioning applied to it (so that the acceleration offset is removed, and the peak detection is improved), it can use a specific acceleration range from ±2g to ±16g, it can set its output data rate register to a specific value, it can have the step count overflow reported as the interrupt on one of the physical pins (INT1, and INT2 pins of the IC, routed to the mikroBUS™ INT and RST pins, respectively), step increment event can also be directed to trigger an interrupt on one of the INT pins. The step detection parameters of the pedometer engine itself can be configured by the user. There are ten pedometer control registers (PED_CNTL1 to PED_CNTL10) that cover various aspects of the pedometer engine, in addition to general configuration registers which are common to all engines of the KX126-1063 IC. These registers affect the step detection sensitivity, the number of steps discarded before the actual counting begins, the scaling factor, etc. The datasheet of the KX126-1063 IC offers a detailed explanation of each register and its function. However, the Click board™ comes with the mikroSDK compatible library which contains simplified functions, that allow simple setup of the KX126-1063 sensor IC and rapid application development. The advanced interrupt engine allows both the interrupt pins INT1 and INT2 to be configured by the user. They can be used to trigger an interrupt on the host MCU, using a wide range of sources, including sample buffer events, various engine-specific events, general purpose interrupts (such as wake-up, data ready, and similar), etc. 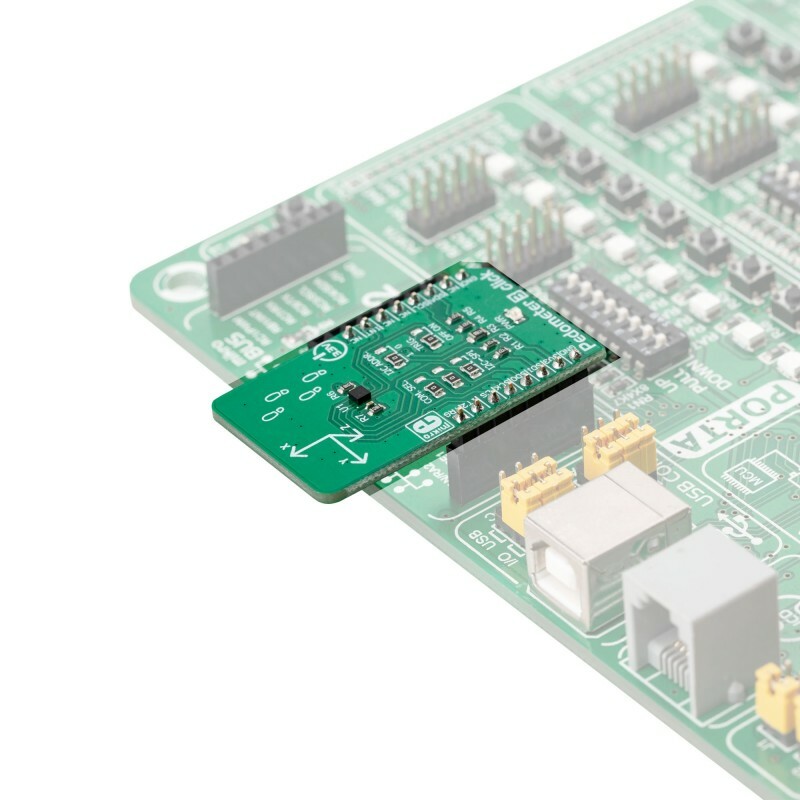 Having two independent interrupt pins is a great solution for optimizing the firmware of the host controller, as the register polling can be reduced greatly, saving valuable MCU processing resources. Another feature of the KX126-1063 IC is its advanced sample buffer, which can store up to 2048 bytes of data. It can be operated in four different modes, including FIFO, FILO, Stream, and Trigger modes. Each mode applies a different set of rules when filling in the sample buffer, and when the watermark level is reached (a user-configurable threshold). The TRIG pin used for an external buffer control is routed to the mikroBUS™ AN pin labeled as TRG. This pin is used when the sample buffer is operated in Trigger mode: a high logic state on this pin will retain all the samples in the buffer up to the current position (not discarding them anymore when the threshold level is reached), continuing to fill the buffer until its full. When this option is not used, the TRIG pin should be grounded, which is done by positioning the SMD jumper labeled as TRIG, to OFF position (the factory default for the Click board™). Again, more detailed information about the advanced sample buffer can be found in the KX126-1063 IC datasheet. Each KX126-1063 device is factory calibrated, and its calibration parameters are stored in the one-time programmable memory (OTP). These parameters include the gain corrections and offset calibration. After each POR cycle, these calibration values are automatically applied, reducing the output error. Along with the used MEMS differential sensing technology, this reduces the measurement error to a virtually unmeasurable value. A built-in self-test function allows reliable operation of the Pedometer 3 click. 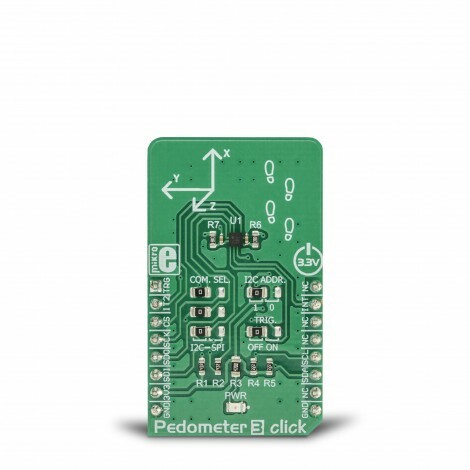 Pedometer 3 click can use both SPI and I2C interfaces. A group of SMD jumpers labeled as COM SEL is used to select either of the communication interfaces. Please note that all the COM SEL jumpers must be positioned at the same setting, else the communication with the Click board™ will not be possible. When operated in I2C mode, the slave address of the device can be changed by switching the position of the SMD jumper labeled as I2C ADD. The Click board™ should be interfaced only with MCUs that use the communication voltage level of 3.3V. Applications It can be used for pedometer applications development, display orientation, HID applications, drop detection applications (for warranty logging), and similar applications that can utilize the advanced motion and acceleration features the Pedometer 3 click can offer. Key Features Advanced motion event detection algorithms, proprietary Kionix MEMS technology, data processing ASIC ensures reliable motion event detection. Support for both I2C and SPI communication protocols, large 2K sample buffer, interrupt engine with two programmable pins, etc. This table shows how the pinout on Pedometer 3 Click corresponds to the pinout on the mikroBUS™ socket (the latter shown in the two middle columns). 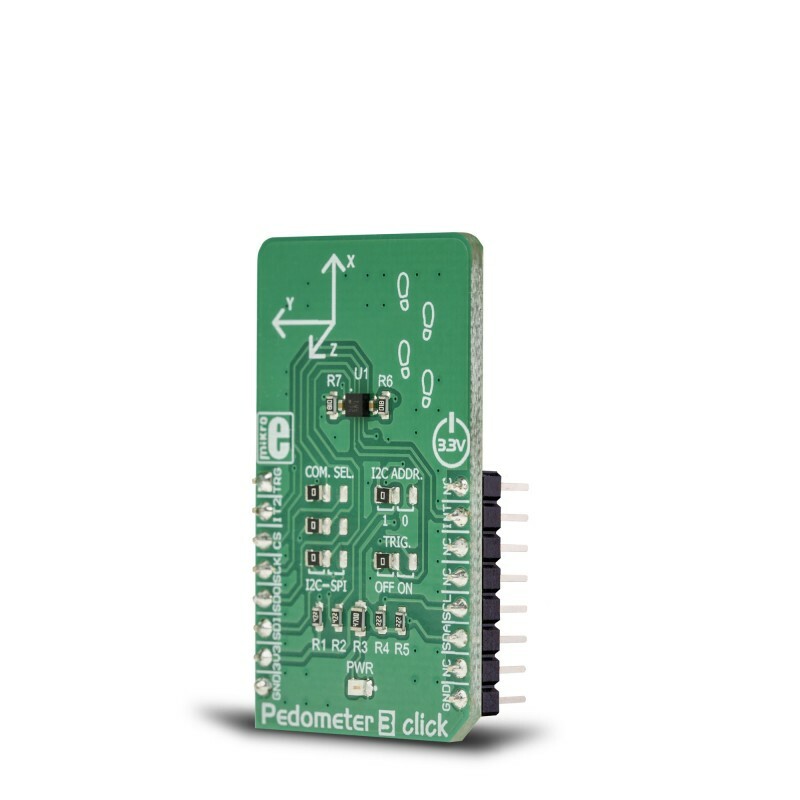 We provide a library for the Pedometer 3 click on our LibStock page, as well as a demo application (example), developed using MikroElektronika compilers. The demo can run on all the main MikroElektronika development boards. The library initializes and defines the I2C or SPI bus driver and drivers that offer a choice for writing data in the register and reads data from register. The library includes the function for reading Accel X/Y/Z axis data, the function for reading pedometer stem counter, the function for detect Tilt and Tap. The user also has the functions for configuration device functions for reads interrupt states. Application Task - (code snippet) - Reads Accel and High Pass Accel X/Y/Z axis and detect Tilt Position. All data logs on the USB UART every 500 ms. Note: The start configuration chip is required at the beginning of each program so that the chip wakes up and prepares for operation and measurement. What is included and set in the start-up function can be viewed in the help file.